Lipgloss & Lashes: 3000 Follower International Giveaway: Win a HD Action Camera! 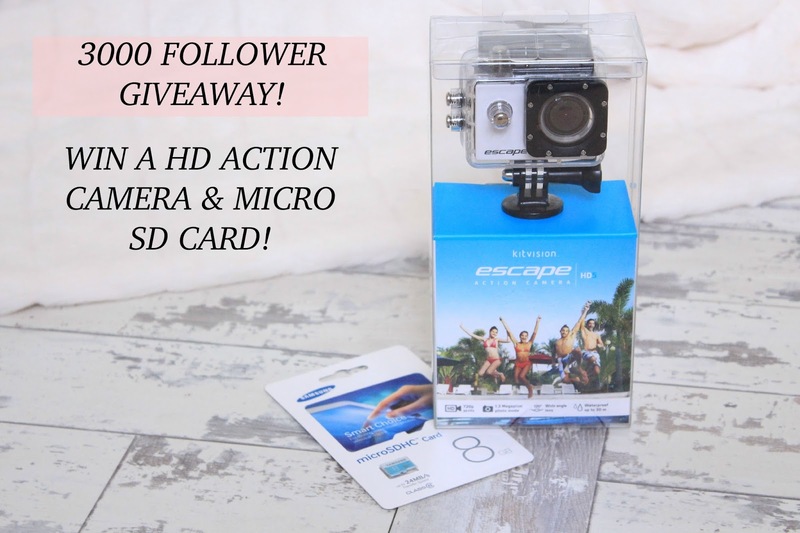 3000 Follower International Giveaway: Win a HD Action Camera! Hello Beauties! In December I hit 3000 followers on Bloglovin and had planned to do a giveaway to celebrate this achievement, however with all of the chaos of the festive season, exams and the fact that I couldn't decide what to give away, it unfortunately never happened. However, as I promised I would do a giveaway (once you say it on Twitter, you pretty much have to keep that promise!) I'm back today with just that! I wanted to thank all of my readers for their continued support, their lovely comments and sweet tweets and what better way than to give them something to say thank you? I wanted to give away something slightly different than the usual MAC Lipstick giveaway, etc and I also realise that although my readers are predominantly female, there are a few males in there who I didn't want to exclude. So I've decided to give away a Kit Vision HD Action Camera. I used one of these while I was away in America last summer, they're so handy as they're compact, are completely waterproof and can be attached to helmets, bikes, etc - so they're perfect for any of you with action-packed lives. However, if your slightly less adventurous, like me, then this will also be perfect for blog events as it's tiny enough to fit into any sized bag and it also takes HD photos. This is also an International giveaway, but please bear in mind that it is a UK Camera so plug adaptors, etc will be needed to charge the camera and do not come included in the giveaway! All you have to do to enter is fill out the Rafflecopter form below and the winner will be chosen at random and notified by email - Good Luck! I would like to see more personal posts! I would love to see more reviews/giveaways for eyeshadow palettes & lip products! I would love to see some hauls! This is an amazing giveaway and so nice of you. I love your blog the way it is and all your post but maybe throw in some ootd if your comfortable as it's always fun to see those! Photography tips would be nice! Wow thankyou for the opportunity to win such an amazing prize! Congrats on your blog milestone - it's fantastic! Perhaps some articles on `other uses` for items you had never thought of. Make-up tutorials and your current hardships and how you're overcoming them. Congratulations :) I'd love to see more hints and tips about blogging/makeup etc..
i love your reviews and lifestyle posts:) thanks so much for the giveaway and congrats on 3000! Congrats! and thank you for an amazing giveaway. I would like to see more beauty posts because they're my favourite to read! Congratulations lovely, you deserve it! I love what you already do, especially your reviews and swatches! You are obviously getting it right with all your followers. I am interested in what colours in cosmetics go with different hair colours. More tutorials, I love trying new looks! So incredibly proud of how far you've come! Congrats on the 3000 subscribers, you deserve it all! Congrats! I'd like to see more tutorials using natural products & reviews of natural & organic products. congratulations !! i would like to see hair style tutorials...like say for an occasion what outfit would go with what makeup and hair ... i am always so wrong with my hair and attire. Congratulations on reaching 3000 follows. What I would love to see more are reviews/giveaways. Thank you for this one. Would love to see more makeup tutorials. Just more of the same – you're amazing babe! Hi! I'd love to see some makeup tutorials - your makeup always looks so effortless and natural I love it! I would love to see more savings tips and maybe hair-do tutorials. More makeup reviews and tutorials. OMG, more review & tutorials please. Divine. . . Wow, prize camera is fab. & splendid. 2 fingers snap. It is tight, fly & off the chain. Thank you for the awesomeness, the contest, and generosity. Pick me, pick me! Dear Santa: I’ve been nice. My X-Mas wish this year is to win this contest. Starving artist here desperately needs the camera to work and eat again. I love to read makeup tutorials and lifestyle posts ! WELL DONE GIRL! You've stormed staright past 3000 followers - check you out!!! #proud! I'd love to see more tutorial type posts and of course want to see your pretty face on youtube!!! Congrats! I always love your reviews - Being a bargain hunter would love to see bargain finds and reviews on some cheaper products to see how they compare to the pricier stuff. I want to see more giveaways and more makeup tutorials and reviews! Wow, congrats on such an amazing milestone! Congratulations; thats a massive achievment. Congrats! :) 3000 is great. My wife is a fan of yours! I love reading about hauls! Congratulations! I would actually love this to go travelling with in September! Need to get myself one of these action cameras! I actually love what you're already doing on your blog but I loved your Valentines Nail Art post! Congratulations on all the followers !Happy to be one of them! I lve natural beuty tips! Congratulations! I like hauls and tips! Thank you for the giveaway, Hope to win! Congratulations on 3000 followers! I love to read haul posts. Congratulations!! I love your blog! I love all your reviews, they're my favourite kind of post and your photos are perfect! Congratulations and I'd love to see more giveaways! I would like to see hauls. Love the layout and colour scheme of your blog - eathereal and refreshing. Congrats on the mark! I like your makeup posts. I would like to see tutorials. Thanks. I'd love to see more of what you're doing! Some camera reviews would be fab! I'd never heard of this one but it looks fab! Congratulations on 3000 followers! I would love to see more reviews. I love reading reviews. Congrats on 3000 followers! I would love to see more reviews - especially video reviews. I've just found your blog and read through. It's comprehensive and accessible so you don't need to do anything else. Congratulations on your followers milestone! I think it is very comprehensive as it is! I love Products reviews :) especially about new releases! I'd like to see tutorials on how to transform plain janes like me into sassy classy ladies! A nixed items for my young teen. Congratulations! Really pretty blog, love it! I'm hoping for more products review, specially treatment for dry skin.